Our first movie to day was the teenage horror flick "Jennifer's Body" written by Diablo Cody. It was actually very funny, well acted and filmed. Our next movie was "Up in the Air" with... GEORGE CLOONEY! Oh yeah... he took the time to sign autographs and stood six inches away from Tina and I and we weren't able to eek out a Hello or anything. We just stood there like Durrrrr. I got some nice pictures of him though. 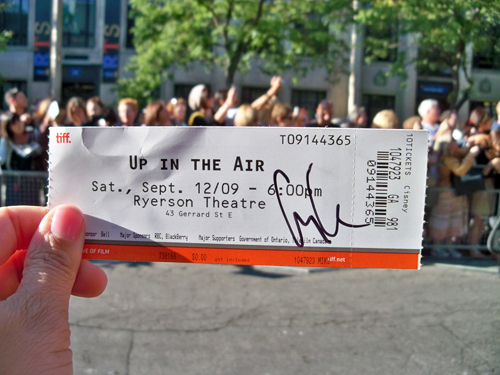 And he signed my movie ticket. Swoon! How was his movie? I've been lurking for years because you always seem to have so much fun and such a great life. This does it, though...Now I'm insanely jealous. I just can't even BELIEVE that!! 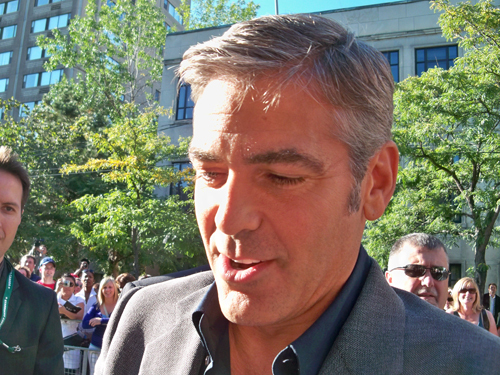 you're sooo lucky to be that close to swoon-worthy clooney! with an autograph, to boot! This weekend I managed to see tons of people waiting for famous people....but no famous people. SWEET!!! OMG, to be that close to him ... he ROCKS!!! He's one of my favorites, and he's *so* incredibly handsome. The movie was funny with some sad parts. George was charming! Mmmm, I like him clean shaven... drool.